This post is Part 5 of a series to augment The Worldbuilder's Handbook available for free download. Start with Part 1 here. This and other mystic resources are gathered in my Magic Directory for you to explore. Using the three properties of magic covered in Part 1 of this series, all the different magics of the Known World are grouped into classes. The foreign magic class arises through diligent study and is developed through honing techniques. 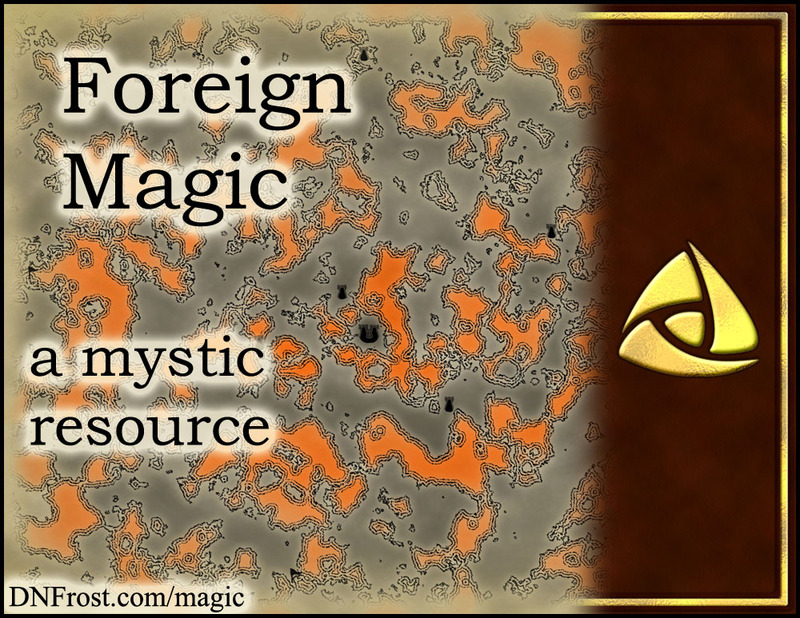 Foreign magic uniquely has no racial predilections, so anyone can learn a foreign magic. While there are inherent limits on how far an individual can master a foreign magic, these limits vary widely between individuals, and the only way to determine one's limit is to study until that limit is encountered. Paradoxically, many natural magics are often studied as foreign magics in my Tales of the Known World saga. Certain magics are not naturally accessible to given races, but these can be accessed through study, giving rise to the odd terminology of a foreign natural magic. Most aspects of natural magic can be accessed this way, except for the rare powers that some mighty individuals are born with. Foreign magics fall into one of three branches: Elemental, Sensory, and Life Magic. See the Magic Codex of the Known World for more information on specific spells. Elemental magic grants a user powers over a particular element. The three foreign elements are: Fire, Ice, and Natural Magic. Fire magic grants a user powers over fire and other heat. This is similar to the natural Dark magic, but never arises intuitively in users. Ice magic grants a user powers over ice and other cold. This is similar to Fire magic, but heat is destroyed instead of created. Natural magic branches can be studied as foreign magics. Though natural Dark magic could be studied, mages usually opt to learn the non-stigmatized Fire magic instead. Check out The Worldbuilder's Handbook for more free resources! Sensory magic grants a user powers over a particular sense. The three foreign senses are: Power, Peace, and Natural Magic. Power magic regards magic and the sense of magic power. Peace magic regards the emotions and sense of emotional balance. Natural magic branches can be studied as foreign magics. Life magic grants a user powers over physical objects and beings. The four kinds of life are: Inert, Magical, Living, and Sentient Magic. Inert magic regards physical, non-magical objects. Magical (or Imbued) magic regards physical objects with magic powers. Living magic regards physical, non-sentient living things. Sentient magic regards physical, sentient living things. That's it for this series! Check out the latest mystic resources for more. Download The Worldbuilder's Handbook here, or start your adventure below.